Einstein once said that imagination is the starting point of everything we do in life, being the preview of life’s coming attractions. He was so right! For example, if we speak about architecture, things have evolved in such a manner that the exuberant imagination of architects has no limits when put into practice. The 21st century buildings are an undisputed evidence of that: innovative concepts, stunning iconic designs, incredible facilities, latest construction technologies. They all are designed with an increased emphasis on minimizing the negative environmental impact of buildings by enhancing efficiency and moderation in the use of materials, energy, and development space. Thus, it’s no surprise that they differ greatly from the ones designed in 20 century. It can be said a lot about architecture these days, but we let you enjoy these 10 futuristic design concepts, examples which bring to us images of a new level in architecture field. In a metropolis like Mexico City where becoming less green space because of steel and concrete constructions, architect Jorge Hernandez de la Garza design this stunning project – Vertical Park- in 2009 as a sustainable response to the potential demands of the city, its main purpose being to revive the calcification of modernity. The Vertical Park is a modular skyscraper made up of a series of stacking units which affords not only spaces for living and working but for urban farming, water reclamation, and solar energy collection. Photos: © Jorge Hernandez de la Garza. R&Sie architecture made use of the latest technologies to design till 2009 this unique 1,000 sqm building with an interesting organic form being an art museum. Located in the Swiss Alps, the Waterflux Art Museum will house the Research Station for Alpine Ice. Its basic structure of the museum is designed to support the surrounding landscape, giving it a natural but inimitable look. Photos: ©François Roche/R&Sie(n). Aiming to attract 15,000 visitors per annum, Indoor Golf Arena® opened its doors in 2011 as “The Ultimate Indoor Golf Experience”. Did you know that? Well, the Zwarts & Jansma architects’ vision for this project is quite spectacular and its outstanding facilities which have together with stunning architecture and sheer brilliance of the design sets for sure Indoor Golf Arena® apart from the others on the market. Unrivalled and unique in the world, the largest and most diverse indoor golf training centre features 12.000m2 Southwest Greens synthetic grass practice facilities, 20 state-of-the-art ProTee Golf Simulators & 28 hitting bays, comprehensive business facilities, incl. meeting rooms, sky lounges, sky boxes and offices, unconventional driving range with 40 bays, Training centre and Short Game Centre of Excellence, able to accommodate National Golf Federations, etc. As an environmentally friendly golf resort, Indoor Golf Arena® is a possible solution to advance tourism and create attractive sports and entertainment facilities without wasting water and energy. Cybertecture Egg represents a new level in the 21st Century’s architecture, a revolutionary form of architecture which encompasses intangible materials of technology, multimedia, intelligence and interactivity. Looking at the world in terms of the planet being a self-sustaining vessel with an ecosystem that allows life to exist, grow and evolve, James Law Cybertecture, a company that embraces the future through continuous innovation and evolution of design and technology, designed this amazing concept. Cybertecture Egg is an impressive building that brings together iconic architecture, environmental design, intelligent control systems, and evolutionary engineering. Featuring an ecosystem of environmental technologies, the building will make the project one of the most sustainably advance designs in the world. Photos: © James Law Cybertecture. Invited for a competition in 2008, NOX | lars spuybroek has designed a family of towers called ‘the three graces’ for Dubai which follow very similar dynamics to that of the art history beauties with the same name viewed as a symbol of powerful and lasting unity. Currently in progress, the unbelievable structures featuring a hotel and two office towers, are interconnected by a 600-meter long footbridge and although they can function separately, their performance is the highest when functioning in unison. They have an amazing exterior aesthetics which is constructed from one load-bearing skin which is geometrically based on small oceanic creatures called ‘radiolaria’. The Three Graces represents a symbolic gateway between human beings and nature- city and creatures of the sea. Photos: © NOX. 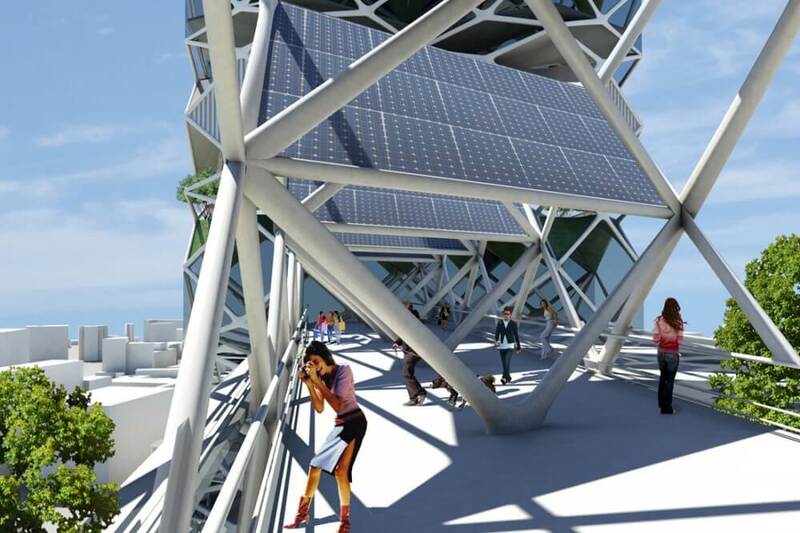 Queens, New York is a conceptual design for a redevelopment of Queens Museum of Art at the World’s Fair site in Queens, New York by Elliot White, a 3rd year architecture student at Pratt Institute in New York. The museum contains a permanent display of a very large-scale model of New York City’s five boroughs. The work included physical and digital modeling experiments in cloth. The intention was to develop sensitivities to surface conditions. Inspired by the form of a drop of water when falling from the heights, the luxury Water Building Resort designed by Orlando De Urrutia will use solar and air power to make clean drinking water, being the first building in the world that transform the air into water. Read more here. Boston architects Howeler + Yoon and Los Angeles digital designers Squared Design Lab have designed a conceptual structure for Boston in 2009, a pre-cycled modular bioreactor for downtown crossing. This original architectural proposal will stimulate the ecology and emphasize the potential of micro-algae, one of the most promising bio-fuel crops of today that can be grown vertically and can produce enough automotive fuel to replace the world’s current diesel usage. The concept is that custom prefabricated modules will serve as bio-fuel sources and as micro-incubators which can be easily disassembled and redistributed to various neighborhoods around Boston, infilling other empty sites, testing new proposals, and developing initiatives with other communities. Exciting vision isn’t it? Photos: © Howeler + Yoon. Defining themselves as innovators, groundbreakers and visionaries, those from Populous illustrate a new level of sustainability with their design for the multipurpose stadium for 17th Asian Games 2014 in Incheon, South Korea. Unlike other stadiums, this one has an asymmetrical configuration with a modular eastern site which, when the main event will be finished, will be reduced down and linked it into the surrounding parklands, to make it an open accessible building, for its people. As Incheon is one of asia’s fastest growing cities, the stadium will be the first landmark building people see when travelling to seoul from the incheon airport, a seven day a week attraction for the local community. Wonderful website. Plenty of useful info here. I am sending it to some pals ans additionally sharing in delicious. And obviously, thanks in your sweat! Hey! I simply want to give a huge thumbs up for the nice data you have got right here on this post. I will likely be coming again to your blog for extra soon. Magnificent goods from you, man. I’ve understand your stuff previous to and you’re just too fantastic. I actually like what you’ve acquired here, really like what you’re saying and the way in which you say it. You make it enjoyable and you still take care of to keep it sensible. I cant wait to read far more from you. This is really a wonderful website. Someone essentially help to make seriously articles I would state. This is the first time I frequented your web page and thus far? I amazed with the research you made to create this particular publish incredible. Magnificent job!